← Good Luck Charms Miami Fall Giveaway! Since 1925 @HialeahPark has been known as a world-class venue for races and events. “The world’s most beautiful race course” has hosted dignitaries and celebrities, been the backdrop for films, and has the distinction of being an Audubon Bird Sanctuary and being listed on the National Register of Historic Places. Newly renovated, the indoor event rooms have all the modern equipment necessary for todays functions. @HialeahPark continues to be as Winston Churchill said, “Extraordinary” and will make all events there be just that. Over 75 years of experience shows because #HialeahParkParties . 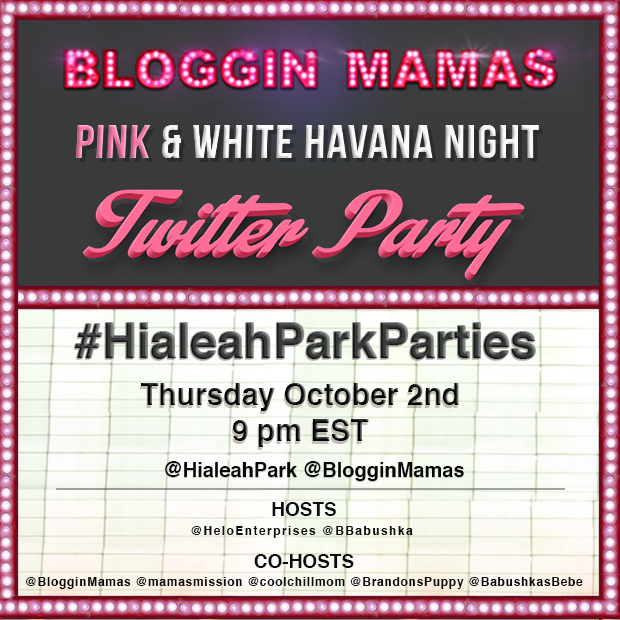 During the Twitter Party there will be a chance to win one of the prizes by answering various Hialeah Park Trivia. Winners will be selected at random from all eligible entries. US Residents 21+. RSVP Not Required, but must RSVP to be eligible for RSVP prize. Disclosure: I am participating in this sponsored campaign on behalf of Bloggin’ Mamas. Any opinions expressed are my own.